The pumps are enclosed in an 8 x 10 ft glass fobre enclosure. It features ventilation for summer and heat for winter to protect the pumps, piping, valves, lighting and control panel housed within the building. The Springerville Generating Station is a state-of-the-art coal-fired power plant in Springerville, Arizona. 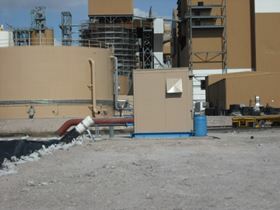 The power plant has three units and a third has recently been added. Unit 4 is a 400 MW coal-fired generating unit and its owners, Salt River Project (SRP) and one of Arizona’s largest utility companies, wanted to increase the capacity of pumps used to move effluent from one pond to another to avoid the possibility of overflow. Effluent water from the Unit’s cooling towers is collected in a lined pond and the power plant’s pumping system delivers water to one of two evaporation ponds. To help them find a solution, the company approached Phoenix, Arizona-based Quadna Inc., a consultancy and equipment supplier which engineers, fabricates and services mechanical systems that move fluids and gases for industrial applications. Although Quadna has supplied the type of equipment specified many times in the past, the price for the barge pumping system for this particular application proved more than the client was willing to spend. This option also posed an additional problem: the customer did not want any impingement of the liner so the pumps and pipe could not be secured. There were other challenges too. The generating station is located in an area known as the Gateway to the White Mountains. The project site is remote and, at an elevation of 7,000 ft, the solution had to accommodate occasional sub-zero temperatures and fluctuating pond levels the result of rainwater and snow run-off. Poole says the Quadna team discussed other viable options with the client. The chosen option would use submersible turbines supported by a pipe at the edge of the pond on a 45° angle or self-priming pumps that would be situated on the dry bank of the pond. Understanding the strict parameters of the project, Quadna pooled extensive engineering resources from its Phoenix and Golden offices to tackle the customer’s needs. The team decided to utilize two Gorman Rupp T2 series model T2A60 v-belt driven pumps with 10 hp US Electric Motors. These pumps were chosen for their reliability and because of the limited net positive suction head (NPSH) available. 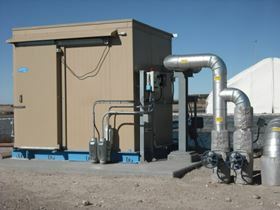 The final step was to enclose the pumps in an 8 x 10-foot house provided by Kysor Panel Systems. The fiberglass enclosure featured ventilation for summer and heat for winter to thoroughly protect the pumps, piping, valves, lighting and control panel housed within the building. “Our relationship with SRP and their engineering company – URS Corporation – the Washington Division which is located in Denver, Colorado, led us to several other orders,” says Poole. “The most recent orders were for the effluent pond leak detection pumps.